New York State voters approve of Gov. Andrew Cuomo’s recent decision to ban hydraulic fracturing, or fracking, by a margin of 55 to 25 percent. According to a recent Quinnipiac University poll, no political party, gender, age group, or regional interest group disapproves of the ban against fracking in New York State. “Safely re-elected, New York’s Governor hides behind bad science and hurts upstate jobs. If something smells fishy to you right now, it’s probably not the bagels and lox. Governor Cuomo’s ban on fracking was justified by a report released on December 17, 2014 by the New York State Department of Health. Summarized here for convenience, we can all benefit from a little New York common sense. 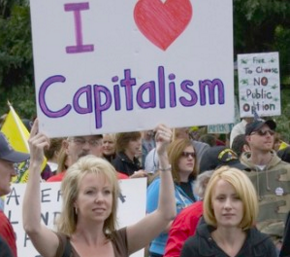 Even those smart fracking fans on Wall Street. When New York State Department of Environmental Conservation (NY DEC) required a review of High Volume Hydraulic Fracturing (HVHF) or “fracking,” New York State Department of Health (NY DOH) complied. Evaluating emerging scientific information regarding HVHF, NY DOH considered environmental public health factors and community health effects. NY DOH evaluation also considered whether such information was sufficient to determine the extent of potential public health impacts of HVHF activities in New York State (NYS). Likewise, existing mitigation measures implemented in other states were examined for effectiveness in reducing the risk for HVHF-related adverse public health impacts. Acting Commissioner Zucker continues, pointing out the uncertain likelihood of adverse health occurrence and outcomes. To this uncertainty is added the unknown effectiveness of mitigation measures in reducing or preventing environmental public health impacts from fracking. The NY DOH Public Health Review of fracking was conducted by reviewing and evaluating scientific literature; seeking input from outside public health expert consultants; engaging in field visits and discussions with health and environmental authorities in states with HVHF activity; and communicating with multiple local, state, federal, international, academic, environmental, and public health stakeholders. “Based on this review, it is apparent that the science surrounding HVHF activity is limited, only just beginning to emerge, and largely suggests only hypotheses about potential public health impacts that need further evaluation. That is, many of the published reports investigating both environmental impacts that could result in human exposures and health implications of HVHF activities are preliminary or exploratory in nature. In total, more than 20 DOH senior research scientists, public health specialists, and radiological health specialists spent approximately 4,500 hours on the NY DOH Public Health Review of fracking risks. NY DOH examined fracking activities for possible human exposure to air and/or water contaminants; naturally occurring radiological materials resulting from fracking; and the effects of fracking operations on communities, such as noise, traffic, and other social changes. They also examined the likelihood of adverse public health outcomes from these exposures to fracking activities. • Community impacts associated with boom-town economic effects such as increased vehicle traffic, road damage, noise, odor complaints, increased demand for housing and medical care, and stress. Texas and Pennsylvania studies with infrared cameras, and a recent West Virginia study from fracking well pads and associated natural-gas infrastructure give evidence of uncontrolled methane leakage, emissions of other volatile organic chemicals, and particulate matter. These emissions have the potential to contribute to long-term climate change impacts from methane accumulation, as well as increased respiratory health risks such as asthma, and odor problems in surrounding communities. Studies as recent as 2014 found evidence of underground methane-migration related to gas leakage from faulty well construction, through failures of annulus cement, faulty production casings, and underground gas well failure due to explosions. This is a significant safety concern because methane-migration can potentially impact private drinking water wells. Potential water contamination is suggested by additional studies. Surface spills, stray gas contamination, and the accumulation of improperly treated radioactive wastes in some disposal and spill sites are noted. 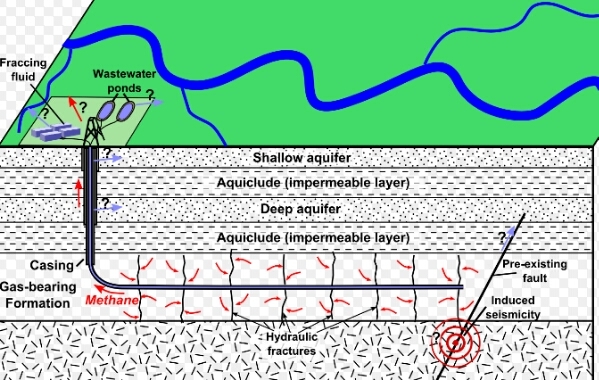 Another study also points out that brine from deep shale formations could potentially be chemically detected in groundwater aquifers residing in fracking operation areas. Drinking water quality could potentially be significantly impacted by all of these contaminants. The review notes that historical examples of rapid and concentrated increases in extractive resource development, for example energy, and precious metals, have resulted in indirect negative community impacts. These include interference with quality-of-life, for example from noise and odors, overburdened transportation and health infrastructure, and a disproportionate rise in social problems, particularly in smaller, more remote rural communities where local governments and infrastructure are not as easily prepared for such rapid changes. As recently as 2013, similar concerns have been raised in some communities of Texas where fracking operations have escalated quickly. Pennsylvania also reports that in counties with heavy fracking activity, rates of automobile and truck traffic-related accidents were between 15 and 65 percent higher in 2010–2012 than in counties without fracking. The NY DOH Public Health Review notes that “well-designed, long-term health studies assessing the effect of fracking activity on health risks have not been completed.” However, they note a 2012 peer-reviewed study and a 2014 university report presenting data indicating statistical associations between some birth outcomes, such as low birth weight and some congenital defects, and residential proximity of the mother to fracking well pads during pregnancy. Proximity to higher-density fracking well pad development was related to an increase in incidents of congenital heart defects and neural-tube defects in the 2014 study. Several health complaint surveys taken from residents living near fracking activities have also been published in 2012 and 2013. Symptoms commonly reported include skin rash or irritation, nausea or vomiting, abdominal pain, breathing difficulties or cough, nosebleeds, anxiety/stress, headache, dizziness, eye irritation, and throat irritation in people and farm animals within proximity to HVHF natural gas development. Federal investigators reported in 2012 on worker exposure to elevated crystalline silica emissions. They found that below-standard work practices and deficient operational controls at fracking well pads contributed to worker exposure. NY DOH points out that this dangerous health risk to workers exposes a similar concern for silica emissions exposure to residents living close to fracking operations. Scientific uncertainties may be reduced through systematic investigations. Further studies are needed to clarify the effects of fracking on earthquake potential, radon exposure, groundwater supplies, wastewater treatment, local air quality, traffic, physical injuries, noise exposure, and psychosocial stress. ● Marcellus Shale Initiative Study, in collaboration with Geisinger Health System, began in 2013. Geisinger cares for many patients in areas where shale gas is being developed in Pennsylvania. Using well and infrastructure data, they are estimating exposures to all aspects of Marcellus shale development in Pennsylvania. These exposure estimates will help evaluate whether asthma control and pregnancy outcomes are affected by Marcellus shale development. 30,000 asthma patients and 22,000 pregnancies in the Geisinger Health System from 2006-13 are being studied, but results are not expected for several years. ● University of Colorado at Boulder, Sustainability Research Network has a five-year cooperative agreement extended to 2017 funded by the National Science Foundation (NSF) under NSF’s Sustainability Research Network competition. Research published from this program investigates relationships between fracking activity and birth outcomes, and potential for methane leakage from natural gas infrastructure. ● EPA’s Study of Hydraulic Fracturing and Its Potential Impact on Drinking Water Resources, begun in 2011. US EPA is assessing potential impacts of fracking on drinking water resources, and to identify the driving factors that may affect the severity and frequency of such impacts. An EPA progress report was released on December 21, 2012 and stated that preliminary results of the study are expected to be released as a draft for public and peer review as soon as the end of 2014, although the full study is not expected to be completed before 2016. ● Pennsylvania Department of Environmental Protection (PA DEP) Comprehensive Oil and Gas Development Radiation Study, started in early 2013. PA DEP is analyzing the radioactivity levels in produced and flowback waters, wastewater recycling, treatment sludges, and drill cuttings, as well as issues with transportation, storage, and disposal of drilling wastes, the levels of radon in natural gas, and potential exposures to workers and the public. ● University of Pennsylvania in collaboration with scientists from Columbia University, Johns Hopkins University, and the University of North Carolina has recently proposed a study of health impacts related to fracking. ● Pennsylvania Department of Environmental Protection recently proposed community air monitoring to determine concentrations of fine and coarse (silica-sized) particles near a transfer facility that handles hydraulic fracturing silica sand. The health risks associated with fracking may eventually be better clarified with the results of these and additional major studies. However, the NY DOH notes that most of these major studies are likely to take years before they are completed. Without a ban on fracking, the NY DOH Public Review makes it clear that the fracking process and related equipment failures could potentially lead to cumulative risks for dangerous exposures and serious associated health risks. Spread across wide geographic areas where environmental conditions and populations vary, the potentially huge number of fracking operations and the dispersed nature of the activity could increase these already significant potential risks. With the release of this Public Health Review on the risks of fracking, the New York State Department of Health states clearly that it is committed to protecting the public health of New Yorkers. Their analysis was comprehensive, thorough, and even-handed. 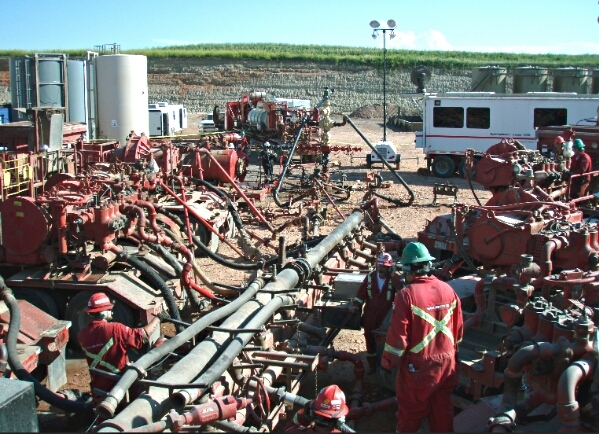 “In assessing whether public health would be adequately protected from a complex activity such as high volume hydraulic fracturing (HVHF), a guarantee of absolute safety is not required. However, at a minimum, there must be sufficient information to understand what the likely public health risks will be.